What Is DA Form 87? DA Form 87, Certificate of Training is a certificate given to soldiers after they have successfully completed certain Army training. 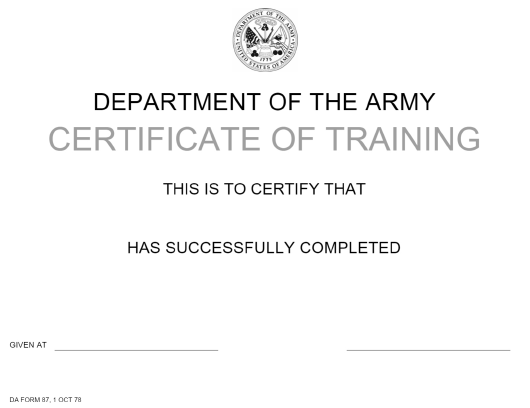 These certificates are maintained in the Digital Training Management System (DTMS) together with all other records of training received by the soldier. The latest edition of the certificate - sometimes incorrectly referred to as the DD Form 87 - was released by the Department of the Army (DA) in October 1978. As of today, no DA Form 87 fillable copies are is available online. A printable version of the certificate is available for reference through the download link below. There are two record-keeping systems used for tracking training results: the Individual Training Record (ITR) and the Unit Training Record (UTR). Each unit commander is tasked with keeping and updating a soldier's ITR to maintain readiness and facilitate the electronic transfer of their training records in case of a reassignment. UTRs provide selected data in order to support training readiness reporting requirements. Information from both the ITR and UTR is reviewed during revisions to the unit's training plan. How To Request Da Form 87? The form is distributed by the Army Distributed Learning System (ALMS) for all phases of the Structured Self Development (SSD). The ALMS will also provide a completion notification directly to the Army Training Requirements and Resource System (ATRRS). Additional guidelines and DA Form 87 instructions can be found in the Army Regulation 350-1, Army Training and Leader Development, revised in December 2017. Training records for all Army units and personnel should be kept in the Digital Training Management System (DTMS) as a part of the Army Training Management System (ATMS). A soldier's Individual training record consists of training certificates (DA Form 87), diplomas, weapon qualification scorecards, physical fitness test scorecards, records from HQDA mandatory training, body fat content worksheets, and other records of training. Records for Army civilians are kept in the Defense Civilian Personnel Data System (DCPDS). All training records should be checked by a unit's immediate higher headquarters to establish compliance with training standards and readiness either as a part of the command inspection program or individually. The intent of the SSD is to connect institutional and operational domains and to ensure that the learning process is continuous and methodical. The SSD is a centrally managed set of content that is completed within specified career points as a mandatory step before attending Noncommissioned Officer Professional Development System (NCOES) courses. Soldiers are eligible to participate in the NCOES program after completing IMT (Initial Military Training) and after subsequently completing the BLC, ALC, SLC, MLC and the SMC. Soldiers enrolled in SSD are required to complete all of the learning activities before obtaining their DA Form 87.